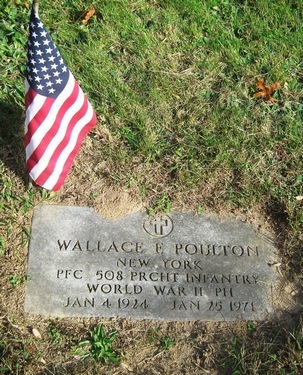 Grave marker for Wallace E. Poulton in the Colonel Ledyard Cemetery, Groton (New London county), Connecticut. Wallace enlisted in the Army at Syracuse, NY on 189 January 1943. Pfc Poulton was attached to Hq 3rd from the Medical Detachment on 26 May 1944. He was listed as seriously injured in 7 June 1944 and was evacuated to the 91st General Hospital three days later. 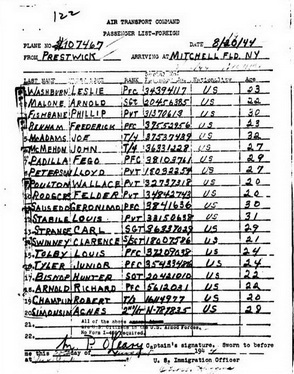 On 20 August 1944 his name appeared on the manifest (lie #9) for Air Transport Command aircraft #107467 from Prestwick, Scotland to Mitchel Field, NY. A nurse by the name of 2nd Lt Agnes Simonsin was in charge of caring for the 19 evacuees on board. The flight crew was all civilian.